As weird as it is, shout out to this glorious HWLF format. Aotearoa's Black Sticks Women strolled into their quarter-final against Argentina on the back of three losses and not just losses, like, losses in which they didn't play very well. I'm not convinced however that this is a case of Mark Hager knows best, or that the team ironed out a few issues during their three pool games, culminating in a 2-1 win over Argentina; the hockey gods said chur and things fell the way of the kiwis. Glorious kiwi hockey fans for sure. The support Aotearoa got against Argentina was immense - as it should be - and this came when they needed it the most. Aotearoa took a 2-1 lead and were then pegged down their own end and those times require pure effort and clarity in defensive execution under pressure. 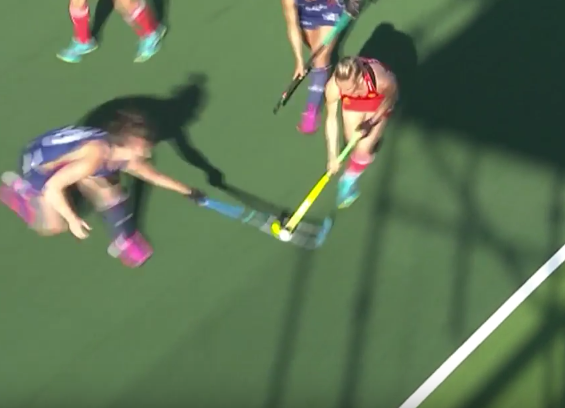 The players stepped up to the plate with their defensive execution and although Argentina missed chances by tiny margins, Sally Rutherford in goal flexed and made crucial saves. The fans offered the juice for that defensive effort, culminating in the kiwis holding on. Both goals for Aotearoa came from penalty corners and this is a bit weird because I can't make any judgements from the kiwis taking these opportunities. The first drag-flick from Brooke Neal took two deflections before reaching the goal and along with Argentina missing their chances, this is what made it feel like it was simply Aotearoa's game to win. We did see a nice PC for the second goal, with Ella Gunson showing a splash of deception as she swung her drag-flick back around to the left, where Stacey Michelsen was waiting. Two goals from PCs, just don't go all-in on Aotearoa having a super slick PC bracket just yet. They will also come up against a fantastic goalie in England's Maddie Hinch (in the semi-final), who will far harder to breach. There was variety in the PCs though which was cool. Neal's flick came after an Olivia Merry step-over and then Gunson was used to flick/pass. It makes sense not to show all your PCs during pool play when you don't need to win games and we saw some funky variations, using different personnel. Hinch and England's defence have a few more set ups to ponder now. The major take-away from Aotearoa's performance is that Sam Charlton and Rose Keddell need to form the core play-making unit in the middle. Play-making in terms of moving the ball to where it needs to go and they are the kinda the only kiwi players who can receive the ball under pressure and make a slick out-let pass. Charlton and Keddell are the engine and with them sitting in the pocket, Stacey Michelsen can burst forward with a safety net in place. Gunson and Pippa Hayward can give Charlton and Keddell breaks, stepping into those midfield roles, while Frances Davies and Gunson can cover defensive positions. In pool play, Charlton and Keddell spent a lot of time in wide positions. Expect them to spend far more time in central roles, with the freedom to hover into wide positions when they see fit. Guess how England's first two goals came about? Correct-a-mundo; hitting the baseline out wide and passing/scrambling towards the goal. Aotearoa would be wise to keep things compact when tackling in the circle and stay mobile. Hanging your stick out there in such confined quarters opens up an easy foot/PC, or players can easily beat a defender with a casual jink, leaving the defender stranded. I like this match up against England. Aotearoa are better when they don't have to force the play and it'll be fine for England to enjoy the majority of possession, allowing for Aotearoa to then attack into space when they get the ball - Michelsen needs space, not running into multiple defenders. Aotearoa's strength is their defence, their back five (six including Rutherford) is quality and if they can handle England's raids down the flanks by staying organised and patient in the middle, England's speed in attack could work against them. They'll burst forward and may leave a few holes for Aotearoa to attack into. Expect a gritty contest and expect England to look better, to appear as they are in control. Aotearoa are a better team when they don't have much of the ball and can then attack into more space, less clutter. Hit an ad if you're enjoying the Black Sticks Women coverage. You'll be making a donation and showing your support, so shout out to you.